Trending at C $53.19eBay determines this price through a machine-learned model of the product's sale prices within the last 90 days. Trending at C $58.77eBay determines this price through a machine-learned model of the product's sale prices within the last 90 days. 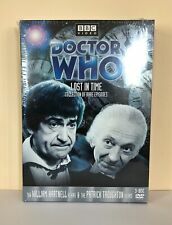 DOCTOR WHO: LOST IN TIME COLLECTION (2004 DVD)/3-DISC/HARTNELL&TROUGHTON/SEALED!